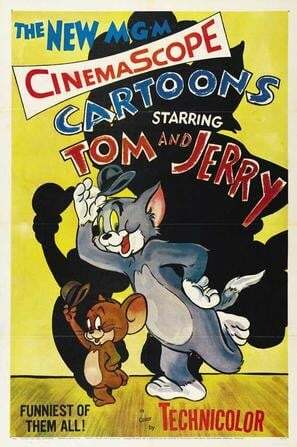 Tom and Jerry is an American animated series of short films created in 1940 by William Hanna and Joseph Barbera. It centers on a rivalry between its two main characters, Tom Cat and Jerry Mouse, and many recurring characters, based around slapstick comedy. A number of spin-offs have been made, including the television series The Tom and Jerry Show (1975–77), The Tom and Jerry Comedy Show (1980–82), Tom & Jerry Kids (1990–94), Tom and Jerry Tales (2006–08), and The Tom and Jerry Show (2014-present). The first feature-length film based on the series, Tom and Jerry: The Movie, was released in 1992 before ten direct-to-video films were produced between 2002 and 2013. Numerous Tom and Jerry shorts have been subject to controversy, mainly over racial stereotypes which involves the portrayal of the recurring black character Mammy Two Shoes and characters appearing in blackface. Other controversial themes include cannibalism and the glamorization of smoking.